It is a story that seems too horrific to be true, but a popular Alabama talk show host who is investigating it says there may be something to it: Homeless people are being victimized by a government agency that is removing them from city streets all over the country and depriving them of their organs. In an interview with Dave Hodges of The Common Sense Show, Josh Coy, himself a host on WYDE, the largest station in Alabama covering a four-state region, said that the story begins with laws that are spreading around the country forbidding anyone from feeding homeless people. Elected officials began implementing such local ordinances as a way to discourage the homeless from settling in their cities, which they feel would hurt business growth and upset residents. But it seems there is something more sinister going on. Coy says that as he began looking into the story, he discovered that homeless people were “literally disappearing” overnight in some cities, as in, they were there one day, gone the next – and no one knew why or where the missing person had gone. But he said few others were asking questions about the strange disappearances because of what he says is a cultural bias against homeless people. Is a government agency behind all of this? 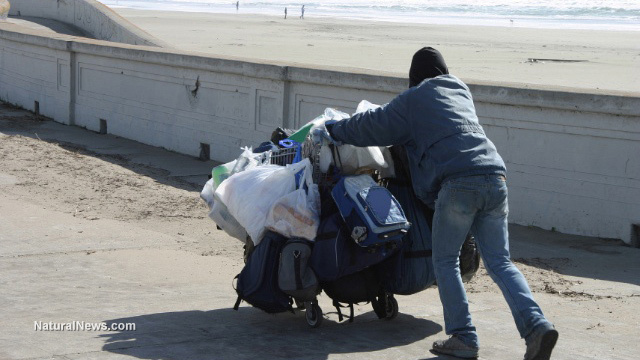 Coy noted that most Americans seem to have a misconception about the homeless – that they are sans homes because they are drunks or substance abusers, which is one of the main reasons few questions were being asked when a homeless person vanished. But that’s not true, he said; the majority of homeless are veterans and others who simply got down on their luck due to job losses and the bad economy. That’s also why, he said, the numbers of homeless have been increasing. “So that’s what led me down the path” to pursue the story, Coy said. Coy said that as he dug, he began to find what he believes is a common denominator in the disappearances: The Federal Emergency Management Agency, or FEMA. The agency, Coy said, has been working under the radar to set up random “soup kitchens” and other areas to feed homeless people, even when it contravenes local ordinances prohibiting such activity. The day after the feeding location is set up, strange unmarked vans show up with people wearing blue jumpsuits who talk with the homeless, and the next thing anyone knows, some of them go missing. While Coy said the people were wearing unmarked jumpsuits, he said they were of a type that FEMA workers generally wear. Hodges, the interviewer, noted that there could be a couple of things going on. One that he suggested was that the homeless may be abducted and then taken to facilities where some of their organs are harvested, like China has done with scores of its prisoners. Hodges also said it is possible that the homeless are being taken to existing FEMA camps where they are used for internment training purposes for government personnel. On that latter point, Coy agreed, stating that Hodges’ theory on that was a prevailing one. For his part, Hodges referenced a U.S. Army field training manual: paragraph “N” of FM 3-39.4, dated February 2010 and titled, “Internment and Resettlement Operations.” That manual, he said, is the blueprint for how U.S. Army and other personnel would take in massive amounts of civilians and then either keep them as prisoners or move them to other locations. Both believe that such camps – and the homeless in them – may also be part of U.S. training of foreign troops who would eventually be placed in charge of them. A Natural News search online for “homeless people disappearing” turned up a slew of stories in the alternative media, most of them reiterating the theory Coy and Hodges made about the FEMA camps. But there was also this: An archived Reddit post from about a year ago, allegedly written by a homeless person, who said definitely that the homeless are disappearing. Listen to the entire Hodges and Coy interview here.